Finish with Tabata Double Unders. Communicate about your diet! This is a Blog hosted by CrossFit Santa Cruz Central and moderated by Michele Mootz. It is for all athletes and anyone who wishes to post comments about their eating. It is intended to create accountability and support for those trying to stick to diets such as the ZONE, Paleo, other insulin controlling diets. It is a forum to post what you ate, didn’t eat, want to eat, shouldn’t have eaten, and to share recipes, ideas, and thoughts on eating. WELCOME! After Wednesday’s Birthday Bashing workout I had an appointment with Asha for a 60 minute Swedish massage. It was fantastic. I think I fell asleep twice. I highly recommend a massage by Asha. My sore muscles had earned this reward and if they could talk they would say, “Thanks, boss!” Continued growth and progress while consistently working out at hight intensity requires proper body maintenance. You are working your muscles hard, eating right, drinking lots of water, getting a lot of sleep, and stretching often – this is good, keep it up. A full body massage is another tool you can use for body care and maintenance. Or maybe use it as a relaxing reward to yourself for staying the course. Talk to Asha at the gym or get ahold of her at the information below. 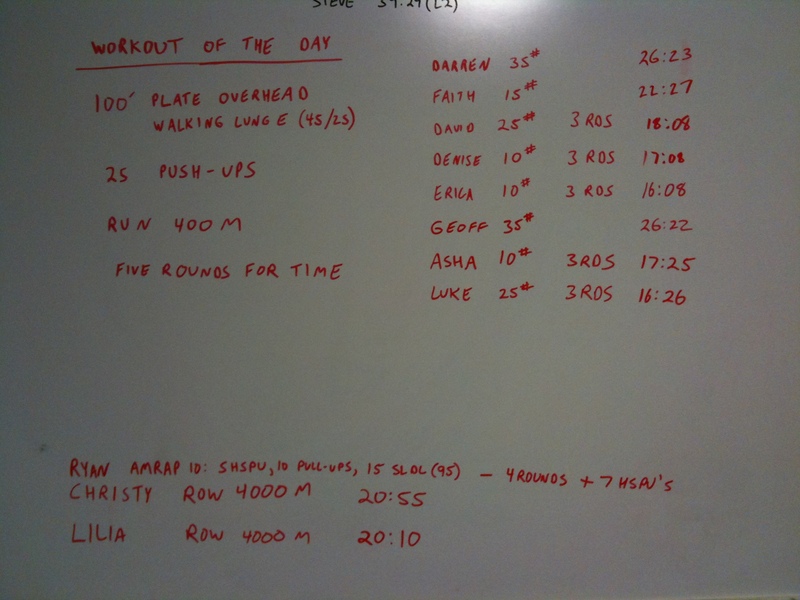 Athlete’s Choice: Friday is the day to make up a missed WOD, work on a weakness, develop a skill, or try something new. Gym open 5:00-6:30 pm. Information for tomorrow – there will not be a workout at CrossFit Placer. You should know this already, we are heading to CrossFit East Sacramento to participate in the Fight Gone Bad IV fundraiser for Prostate Cancer Research and the Wounded Warriors project. Copied from CrossFit East Sacramento’s Website, click here to go to their page. Early registration starts at 9:30 AM and the first heats will be held starting at 10:20. Heat times will be assigned on a first come first serve basis, so if you get here early you will have first choice on your heat time. You can expect to be participating in the workout for about an hour. You will be paired up with another athlete and will take turns performing the Fight Gone Bad WOD and keeping score for one another. The first group of athletes will cycle in starting at Wall Ball and will perform 3 rounds of the WOD. When all athletes in the first group finish, they will stay in the WOD area to keep score for the athlete that kept score for them. Each station will have a head judge to enforce proper movement standards and the entire WOD area will have a head judge to oversee proper movement standard enforcement. Half reps will not be counted, this is going to be a legitimate CrossFit competition! We hope you have been trained well. Parking tomorrow is going to be jam packed. Please consider carpooling or biking in for those of you who can. The street parking in the surrounding area is limited. 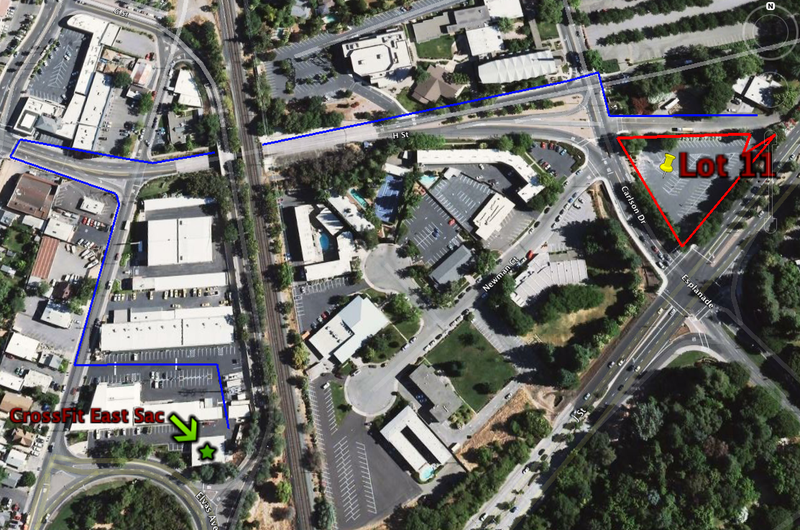 For ease of parking, please use Lot 11 of CSUS shown on the map below. They have given us permission to use their parking lot for the event. It is only 2 blocks away and will save you the effort of driving all over the place to find a spot, then having to walk 2 blocks anyway, and possibly getting a ticket for parking where you are not supposed to. Please use Lot 11. If you are not signed up yet, WHAT ARE YOU WAITING FOR!? Sign up now by clicking the link in the upper right of the screen. If you can’t make it, donate anyway to two causes that are likely to have an impact on your life at some point. Late entry will be accepted on the morning of the event, but things will run much more smoothly if you preregister online. See you all tomorrow morning, great job raising donations! $16,560 as of last night with the help of our surrounding affiliates. This is going to be epic. CrossFit East Sacramento In The News!! Score by adding up maximum lift from each of the three exercises. Three attempts (after warm-up) for each lift. Lifts done in order, squat, press, deadlift. CrossFit East Sacramento got some great news coverage on yesterday morning’s news shoe on Fox 40!! Check out the following videos. This is where we are joining in the CrossFit nationwide Fight Gone Bad IV workout/fundraiser. If you know anything about CrossFit East Sacramento, then you know they are a perfect representation of a CrossFit gym at its best, and just as importantly, a true representation of the CrossFit spirit! Congratulation’s to CrossFit East Sacramento! For those who finish the WOD, there will be ice cold raw milk and Oreos to celebrate Kevin and Faith’s birthdays. Article: Supplementation of DHA (like fish oil) boosts cognitive development in infants.
. . . “However, our results clearly suggest that feeding infants formula supplemented with high concentrations of DHA provides beneficial effects on cognitive development. Furthermore, because infants who display superior performance on the means-end problem-solving task tend to have superior IQ and vocabulary later in childhood, it’s possible that the beneficial effects of DHA extend well beyond infancy.” . . . Except for the run, all exercises are completed with PVC pipe and the reps are done in synchrony. The team stays together for every rep. The run is kept to the pace of the slowest runner. More information: Heat assignments will be on a first come first serve basis, so if people need to leave early, get there early and get signed up. We have a handful of volunteers from the National Personal Training Institute who have been trained in the methods of FGB by their instructors. They will be assisting in the warm up area giving instruction on how to perform the movements correctly and giving final briefing on how the WOD will be performed. Athletes will be paired up with a partner who will keep score during their heats. After one group of athletes finishes their heat, there will be a couple minute break to recover. Then they will trade places with their partner and keep score for them. Each station will have a volunteer head judge who will be responsible for keeping movement integrity to a competition standard. It looks like we will have about 100 athletes performing the WOD and we will have 4 different scaled versions of the WOD. There will be a men’s and a women’s Rx station, a station with 35# barbells, and a 2 round version with very light dumbbells and small boxes in which kids and grandparents will be able to perform the WOD safely. Come one, come all. Friday is athletes choice. Anything goes, do what needs to be done, address week links, test yourself. Since Fight Gone Bad IV at CrossFit East Sacramento is only 7 days and a wakeup away, spending some time on the following ‘heavy’ FGB focus work can not hurt. Work one minute on, full sprint. Rest as needed between efforts. Start with your weakest link and finish with your strengths.